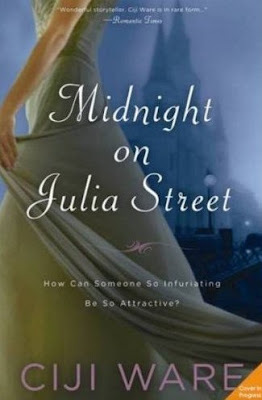 Thanks to the re-issuing of Ciji Ware's novels by Sourcebooks I have become a huge fan of the author and am super excited to see that the next to be re-issued is Midnight on Julia Street ! It sounds a little different than what I normally read but she hasn't steered me wrong yet, so I am definitely checking it out! Ciji Ware's acclaimed time slip novel weaves together romance and history with the sultry and timeless flavor of two eras of New Orleans. TV reporter Corlis McCullough's investigation of a century-old mystery involving spectacular 19th-century buildings under the threat of the wrecker's ball brings her back into the orbit of her old college nemesis King Duvallon. But now they're mature and companionable, and King shows Corlis a fascinating, hidden side of New Orleans society. Then she begins to be pulled back into the past where corruption, violence, and greed mirror the events of the current day. I love time slip novels! I look forward to the release of this one. First time I have heard of this book. Thanks for the update. Ooo, I'd love to read something about New Orleans. I was just there in March. Such a cool city! Intriguing story line. Having just visited New Orleans, it lends itself quite well to this type of story.